Brooklyn Beckham signs for Arsenal FC! Like father, like son, ey? 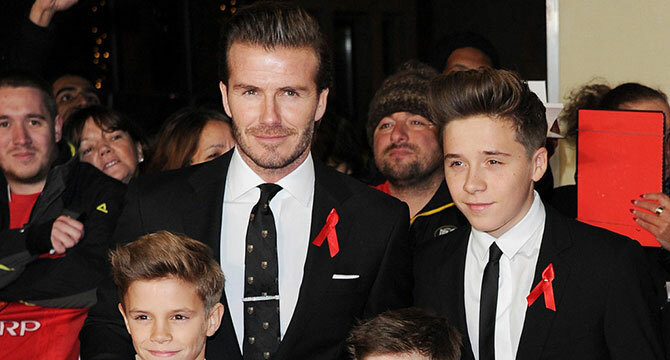 David Beckham’s oldest son Brookyln looks to be following in his father’s footsteps – by signing for Arsenal! Brooks has just put pen to paper on a short-term contract for the Gunners! The 15-year-old was also wanted by Manchester United and Chelsea but chose to join the North London club instead! His younger brothers Romeo (12) and Cruz (9) are also training with Arsenal too! Dad David is good mates with Arsenal boss Arsene Wenger and previously trained with the club two summers ago to try and keep fit!